The performance of an Azerbaijani mugham trio and Prague Modern orchestra on the basis of compositions by Gunay Mirzayeva and Francesco Maggio was of great interest to the visitors. Diplomats, Azerbaijanis living in the Czech Republic and representatives of communities were among the guests. 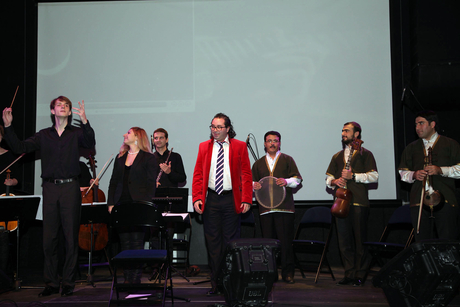 The concert was covered by Czech, Azerbaijani and Turkish media. ASN representative in the Czech Republic Sabir Mammadov in a speech before the concert spoke about the necessity of implementing such projects to deepen the relations between nations. The audience also watched promotional videos about AZEDER and ASN. A concert of the young and democratic Azerbaijan once again showed Europeans how rich the country's culture is. Drinks and samples of Azerbaijani national cuisine were presented to the guests before and after the event. The concert made a great impression upon the visitors.